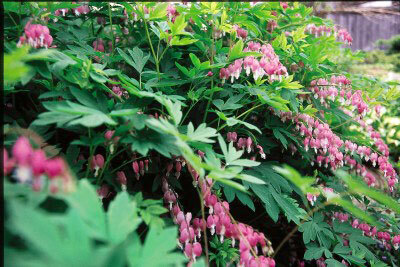 These showy, elegant plants are a longtime garden favorite often called “old-fashioned” bleeding hearts. They produce soft green leaves topped by arching sprays of pendulous, heart shaped pink flowers an inch or more long. Bleeding Hearts bloom from late spring to early summer and grow best in well-drained, fertile soil. They tolerate full sun in cooler locations, elsewhere they need partial sun (less than 4 hours of direct sun). They do not do well with high heat. They attractive butterflies and hummingbirds, and are deer resistant.